These particular graphic novels are part one and two of Assimilation 2 (not quite sure what assimilation 1 entailed, but that is neither here nor there). 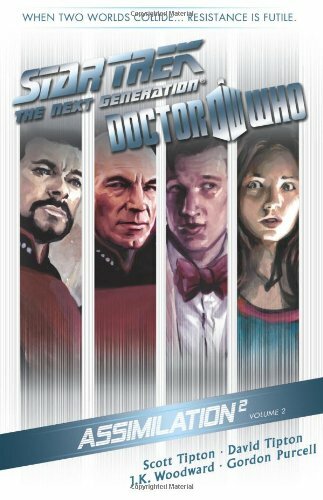 Assimilation 2 is a mashup of the characters from Star Trek Next Generation (for those non Trekkies out there.... that's Captain Picard's timeline) and the characters from Doctor Who during 12's (bowtie doctor) regeneration. Also found in this story line are the 4th Doctor (long scarf doctor) along with Captain Kirk and crew. 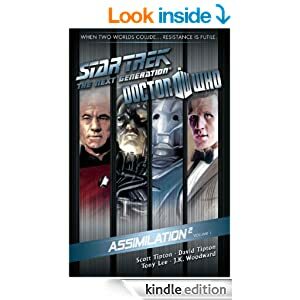 In this story line the Cybermen team up with the Borg to attack and attempt to assimilate Captain Picard's universe. For the Trekkie and Whovian that I am I absolutely LOVED this story! It felt just like every other Doctor Who episode. Complete with a few jumps back and forward in time and the Enterprise crew getting a peek into the Tardis- "Yep, its bigger on the inside!" It was also hilarious to find that both The Doctor and the Cybermen were impressed by Data who even manages to save the Tardis from the Borg! I won't go into further detail here as it would spoil the story but it really was an entertaining read! Hubby also gave me a book of Sherlock Holmes puzzles- when I finish that one I'll be sure to let you know how it was! It's intriguing so far!